A writer, journalist and academic. Richard Cockett is a writer, author and journalist specialising in foreign and political topics. He is currently staff correspondent and editor at The Economist. Richard approached us in early 2015 in anticipation of the release of his forthcoming book, with a view to us designing and building a website that could showcase and market his collection of books, publications and articles, as well as act as a personal blog. We met with Richard to discover more about his work and to make sure we had a clear understanding of his writing style and personality. After discovering the different needs of the project, we developed wireframes and a content strategy to help Richard pull all of his work together in a format that would work well on the website. Richard wanted the site to showcase his previous writing, and to also highlight that his books were available to buy online. To do this we created individual book pages, which are very visual and provide a round-up of the book's content and accompanying reviews. Richard's writing is non-fiction, primarily focussed on history and politics, so we gathered additional resources and image galleries - which complement the content of the books, and provide a valuable extended resource for people interested in his subject matter. We added clear calls to action to push visitors to purchase his book online. A book 'slider’ on the homepage also enables the viewer to browse through his previous catalogue of work in a 'bookshelf' style. 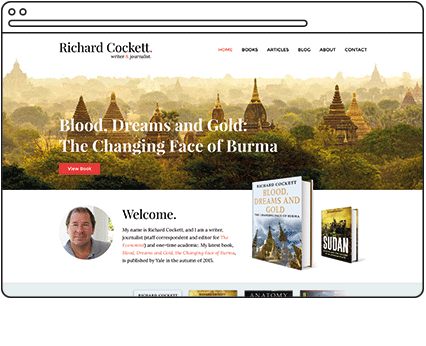 The result is a fully responsive website, that promotes his books and that Richard can edit and add to, as and when he produces new work.